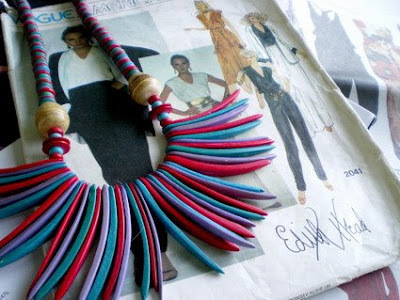 SPEAKING of patterns and fashion flashbacks, I am loving this bright pink and blue tribal beaded thing. I picked it up for $4 from a Salvos. I’d have walked straight past it except for Home Girl’s post about her collection of beads. I think it would be the perfect accompaniment to a simple black or monochrome jumpsuit. The Vogue America pattern is for a simple pair of pants and top, that with a belt, will look much like a jumpsuit (and hopefully be a little more user friendly). I’ve booked marked plenty of magazines for inspiration but keep coming back to a simple, light (crepe maybe) black suit. Want more inspiration? Check out Clarewen’s collection of all-in-ones. That's some collection you have picked up on your spree! hey! thanks for visiting my blog! i'm so into yours here. the denims/bleach treatment looks great! and i'm into the belted and bunched look too. sounds very cute. this necklace is killer, and i allllsoooo love that german mug with the orange. i love the coffee cup section at thrift shops... what fun! so you just focus on scavenging/shopping adventures? i sooo wanna go thrift shopping nowwww! Very cool statement piece, nice find!